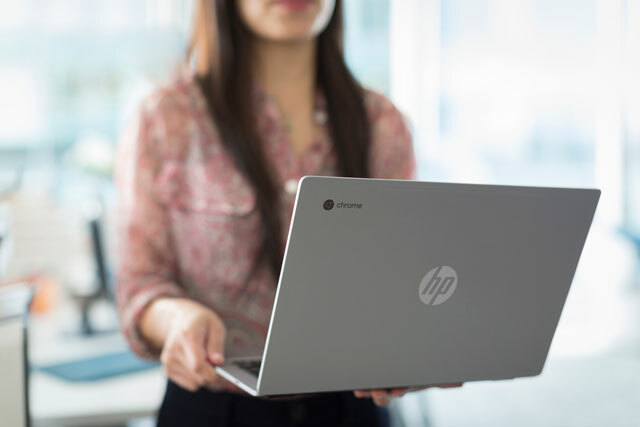 The Chromebook has come a long way since its introduction in 2011, and HP’s all-metal Chromebook 13, which was announced today, is certainly a testament to that. The Chromebook 13 looks like a fusion between an HP laptop and Apple’s MacBook with its shiny, metallic silver body and its 12.9 mm thin housing (just beating the MacBook’s 13.1 mm thickness). The anodized aluminum chassis supports a 13.3-inch QHD+ display with a resolution of 3200 x 1800, and it all comes in at a fairly light 2.86 pounds. This computer is more than just a pretty face—under the hood there are some seriously powerful specs. It’s the first Chromebook to have a sixth generation Intel Core M processor, and it’s configurable to up to 16 GB of memory for quickness and easier multitasking. The battery also provides a long 11.5 hour life between charges (although not as long as Acer’s Chromebook 14). It also features two USB-C quick charging ports (plus a full-size USB port), which. HP says you can even charge the Chromebook 13 with a USB-C phone charger, so you won’t even have to bring a tangled mess of charging cables with you everywhere you go. The laptop runs the Chrome operating system, so you’re a bit limited in the apps you can run. But for anyone who relies upon Microsoft Word, Powerpoint and Excel, apps like Google Docs, Sheets and Slides come pre-installed and continuously connected to the cloud. Spotify, Google Play Music, Netflix and YouTube apps are also available for download. For privacy buffs, there are a ton of security features. The Chromebook automatically updates, features sandboxing (so if you’re on an infected page, the rest of the computer is safe), performs verified boots to make sure nothing has been corrupted and offers data encryption and recovery modes. The Chromebook 13’s Lucid Sleep feature is an added bonus. Data and messages are updated continuously while the computer is sleeping so there’s no lag time when you come back to the computer. Those added minutes will really boost your productivity. The HP Chromebook 13 starts at $499, and will be available, according to the company, in April, which means it will be out within the next few days.